am Tisch beim kühlen Wein. This is a short drinking song with a text attributed to W. A. Mozart and set by him. That chilled wine much surpasses. A simple song form with 'repeat-sign' repetitions composed for baritone, in a light-hearted vein. 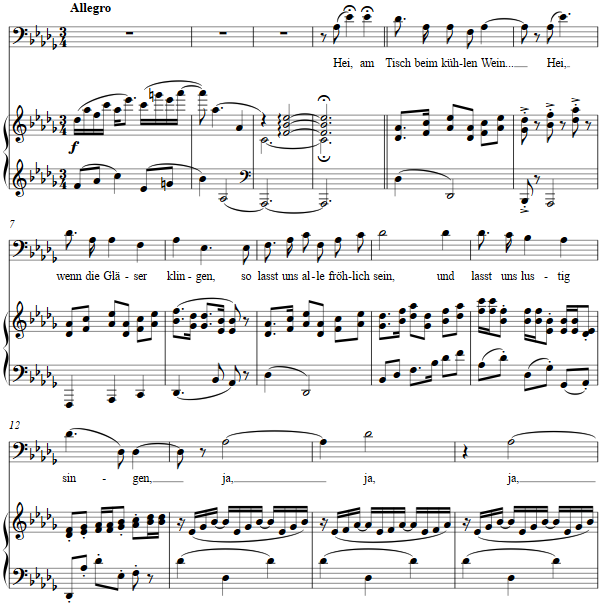 The score for Am Tisch beim kühlen Wein is available as a free PDF download, though any major commercial performance or recording of the work is prohibited without prior arrangement with the composer. Click on the graphic below for this piano-vocal score.